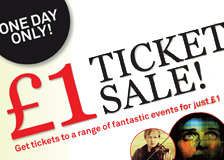 The Royal Liverpool Philharmonic £1 ticket sale!!! £1 ticket sale – one day only! On Sunday 8 September from 10am to 2pm visit Liverpool Philharmonic Box Office for the chance to get concert tickets for only a quid! Tickets must be purchased IN PERSON from the Box Office at Liverpool Philharmonic Hall, Hope Street, Liverpool. 100 Tickets per event available – when they’re gone, they’re gone! *Tickets must be purchased in person at Box Office on Sunday 8 September. Seating is at the Box Office’s discretion. Limit of 4 tickets per person TOTAL. Cash payments only. Offer does not apply to previously purchased tickets. This entry was posted in The Tour Blogs & Brendan's Solo Blogs and tagged "Royal Liverpool Philharmonic Orchestra", 'RLPO', 1 £, Hall, liverpool, one, phil, philharmonic, pound, sale, ticket. Bookmark the permalink. 1 Response to The Royal Liverpool Philharmonic £1 ticket sale!! !